Councils across Scotland have made significant efforts to reduce waste and litter, and improve recycling services offered to local residents. However, we are still a long way away from meeting our targets, and the current approach costs local taxpayers significant sums in terms of litter collection, recycling, and emptying street bins. Elsewhere, local authorities have backed deposit return as an efficient way to reduce cost and litter, with Local Government New South Wales estimating it would reduce their recycling costs by 40%. The Waste and Resources Action Programme (WRAP) released a report in 2016 showing that many councils across the United Kingdom are now losing money because of increased Gate Fees at Material Recovery Facilities. 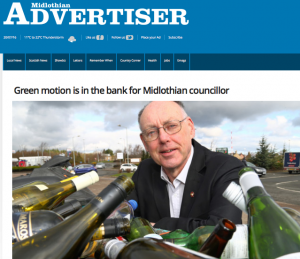 Here in Scotland, Aberdeenshire Council and Midlothian Council both voted unanimously in support of a national deposit return system in March 2016. Kerbside collection is an important part of the recycling mix, but as much as 50 % is lost during collection, sorting, and processing, and the materials it collects are mixed together, which reduces their quality. A deposit return system collects the containers separately, which increases their quality and therefore value. 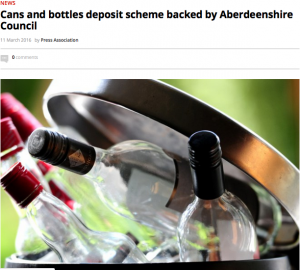 Kerbside collection is also expensive for local authorities, which is why research commissioned by the Scottish Government said deposit return could save local taxpayers £13m a year across Scotland. Reduced litter would also save money for local authority street cleaning budgets. What’s more, we consume up to 40% of drinks away from home so kerbside collection doesn’t help much with that. Not everyone has access to kerbside recycling either, especially in more rural areas and some parts of our cities. Instead, many urban centres have communal recycling bins on the street, and keeping cans and bottles out of them saves councils money and results in better-quality materials for use in recycling.